Think you have one of the most innovative Career Technical Education (CTE) programs of study across the 16 Career Clusters®? 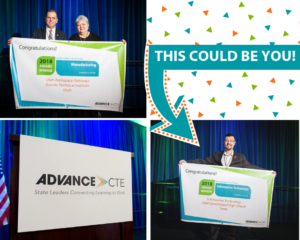 Don’t miss your chance to apply for Advance CTE’s annual Excellence in Action award. Applications are open to secondary and postsecondary schools/institutions. Apply by November 21, 2018 here. Need tips on filling out the application? Watch our recent webinar and hear from a 2018 award winner. If you want to see examples of some stellar programs of study, take a look at all of the 2018 winners here. Showcase your program on the national stage! The success of your learners, partners, faculty and instructors will be highlighted in articles and blogs throughout the year. Recognition at the Advance CTE Spring Meeting in Washington, D.C. Representatives from winning programs will receive travel and lodging to honor your program at an awards ceremony in front of State CTE Directors, state leaders, national partners and the media. Celebrate your program in your own community with a physical and digital banner. Demonstrate what high-quality CTE programs of study look like at the national, state and local levels. This entry was posted on Friday, November 9th, 2018 at 9:47 am	and is filed under Uncategorized. You can follow any responses to this entry through the RSS 2.0 feed. Both comments and pings are currently closed.